Are you seeking a meaningful volunteer experience in one of the most mesmerizing and uncrowded countries in tropical South Asia? Volunteer in Sri Lanka, and have the opportunity to explore the ancient ruins, spotless beaches and hot surf spots, majestic elephants and famous tea and cuisine, while making a real difference to the lives of those in need. Discover the hidden gem of South Asia in Sri Lanka! Despite its small size, Sri Lanka has a wide range of geographical features and is rich in natural beauty. Much of Sri Lanka is covered in tropical forests, with hundreds of rivers flowing through them, often cascading in awesome waterfalls. There are also many spectaculars hills, pristine beaches and magnificent ruins to enjoy. But despite this beauty, Sri Lanka has suffered from years of civil war and natural calamities like Tsunami of 2004. These events have caused widespread devastation and made life very difficult for poor communities. There are many local grassroots organizations aiding the effort of the government to bring development and relief to the poor. New Hope Volunteer works with many of these local organizations that are trying to empower the poor and bring development. With the sunny disposition of the locals and the recent opening of the country, Sri Lanka is becoming a fast favorite as a location for Volunteer Abroad programs. 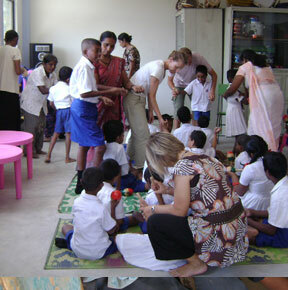 Volunteer in Sri Lanka, and discover its verdant tapestry and the gracious hospitality of the people! New Hope Volunteers will arrange for the accommodation and meals throughout the volunteering duration in the Sri Lanka program. Volunteers will stay either in a hostel or with a host family. At the hostel, you might be sharing a room with other volunteers, a fantastic opportunity to swap stories and experiences. Our host families have all been carefully screened before being selected to participate in New Hope's volunteer programs. Our host families also have significant experience in accommodating international volunteers. Your hosts will provide you with a warm, comfortable and secure place to stay, while giving you the wonderful opportunity to learn about the culture. At least one member of the family will be able to communicate with you in English. Your host families will also provide you with 3 local meals, all of which will be clean and hygienic. New Hope also offers extensive support for you so that you feel right at home while volunteering. We offer many layers of support in Sri Lanka, as and when you require. The main person supporting you throughout your program will be our country coordinator in Sri Lanka, who is also in-charge of your volunteer program. Whenever possible, the coordinator will call or visit you to see if you are happy and satisfied with your project. You will also have the coordinator's mobile phone number that you may call any time you wish to discuss anything. Our project staff will also guide and help you throughout the program. How could I make my payment? Will I have time to explore Colombo during my language and culture program?